Whether you’re looking to make a career out of archery or you’re simply just curious about trying one, given how many different models of stabilizers there are on the market, it isn’t a simple feat to just point one out and declare it to be the best bow stabilizer. If you’ve just picked up your bow, or you haven’t been using it for quite a while, you may have seen a professional archer in a competition with these weird things protruding from their bows and wondered to yourself what in the world they were for. Well, those things are called stabilizers. We’re sure you can guess what they do base on what they’re called, but not only stabilizers stabilize bows and arrows! They also have several other functions, such as absorbing the vibrations during a shot, which reduces shock felt in the hand, adding weight to keep the bow balanced, settling the archer’s aim, and the like. To put it simply, they make things much easier for an archer. In fact, stabilizers are such great tools that professional target archers consider them essential. An average or a hobbyist archer would most definitely do not need it, but if you want to take your archery skills to the highest level, or even if you’re just curious to try one out, then we’re happy to inform you that there are tons of good things that come with using a stabilizer. The trick is, of course, finding the best bow stabilizer that works for you! And that is one of the objectives of this set of short stabilizer reviews. In this article, we will introduce you to three good product examples on the market today. The NAP Apache Bow Stabilizer features dampening materials that effectively eliminate the vibrations and silence your bow at the shot. Perfect for those of you who primarily use your bow for hunting game or for those who feel like they just need a quieter bow in general. 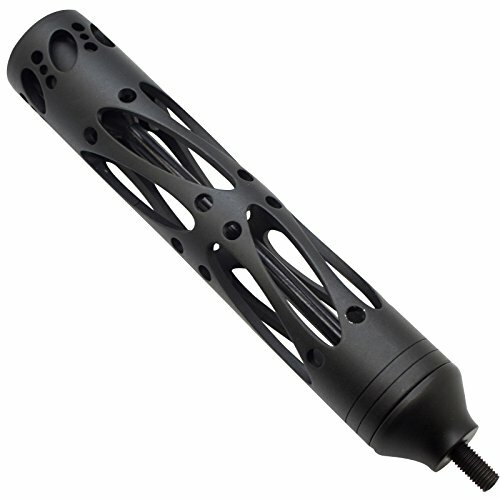 The Apache Bow Stabilizer is designed to give you the best balance possible. It measures in at 10 x 7 x 2.8 inches and weighs in at 7.5 ounces. It also comes with a removable 3-inch long carbon fiber accessory bar, which allows you to adjust the weight of the Apache Bow Stabilizer to move further away from the bow, meaning you can adjust it until it gives you the perfect balance. The SAS Archery Aluminum Bow Stabilizer comes in different weights and sizes, all featuring precision aluminum design. Choose the size and weight that best work with your bow to give you the best stability possible. It comes in these measurements: 5.3 ounces in 5 inches, 6.5 ounces in 8 inches, and 10 ounces in 11 inches. Each is designed to give you full draw counter balance. Not only is the SAS Archery Aluminum Bow Stabilizer designed to give you great balance, but it is also made with superior dampening technology. It significantly reduces the vibrations on the shot, effectively reducing the sound produced by the bow. 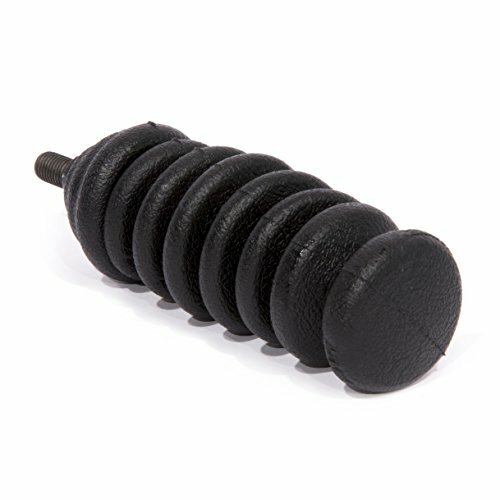 Designed with an innovative and unique continuous spiral design, the LimbSaver S-Coil Bow Stabilizer is lightweight and designed to increase the surface area to reduce vibrations effectively, as well provide you with a smoother, more balanced feel overall by reducing bow torque. The LimbSaver S-Coil Bow Stabilizer is perfectly balanced, measuring in at 4 1/2 inches and weighing 4.5 ounces. The stabilizer’s energy-absorbing material is made with LimbSaver’s NAVCOM or Noise and Vibration Control Material technology, and the coiled design increase the surface area of this material to allow it to create nodes that cancel vibrations independently. This allows it to dramatically reduce not only noise but recoil and bow jump as well, allowing you to remain perfectly stable. This stabilizer is designed specifically to be used out in the world; it’s incredibly durable and made to be used in harsh environments. Plus, it’s quick and simple to install and disconnect and won’t suffer any wear and tear from doing so. The general functions and features of a bow stabilizer, specifically a good one, really remain the same across the board. Whether it’s one designed specifically for hunting or sports, there’s not much variation. You can see that in the features of these three units. A good stabilizer will need to, well, give you stability and to do that you need the perfect weight to prevent torque effectively. These three products reviewed are designed to do that. They also all reduce bow vibrations, dampen sounds at the shot, tighten up groups, and keep you balanced overall. The winner of the best bow stabilizer award can change depending on why exactly you’re in the market for a bow stabilizer. If you primarily use a bow to hunt game, then maybe you’d rather have a stabilizer that effectively eliminates all noise rather than one that is made for professional athletes in competitions. In general, however, a good bow stabilizer should first and foremost provide you with the best balance possible. It should tighten up groups, make aiming with precision easier, and reduce shock felt during the shot. As you can see above, all three are designed to do just that. And if none of these three tickles your fancy, then at least use them as a guideline on what to look for in a good bow stabilizer. But for the sake of having a winner, the title of best stabilizer goes to the LimbSaver S-Coil Bow Stabilizer. It’s got everything you could need and works great for either game hunters or professional athletes.